I am having some problems understanding recombination, and I am not sure what element I am missing here. This figure is an example from my text book. The pedigree belongs to a family with an autosomal dominant disease, typed for a marker with alleles A1-A6. 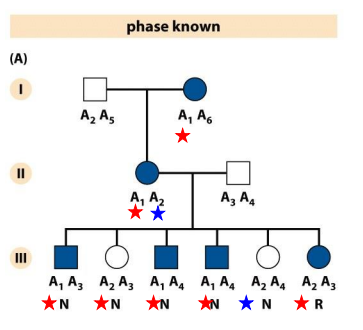 So, all meioses are phase-known, meaning we know which combination of alleles was inherited from each parent. Apparently this leads us to be able to unambiguously score III1-III5 as non-recombinant (N) and III6 as recombinant (R). This is were I get lost, I don't understand how it is possible to unambiguously score each individual as N or R. Also, if the disease is dominant, how is it possible that III6 is affected, as both alleles originate from the both unaffected I1 and II2? EDIT: Blue colour in the pedigree means the person is affected by disease, white symbolizes unaffected individuals. I believe the red stars symbolizes that the person carries the disease gene. That would mean blue corresponds to not carrying the disease gene. If this is the case The red colour of III2 is a fault in the figure. Ns are not non-recombinant at the genomic level. What you know is that they do not show recombination events at the risk allele locus as subjects carrying the marker A1 show signs of the disease and similarly healthy subject do not carry the marker A1. Hence they are called non-recombinant. On top of that 3rd generation subjects (excepted III6) show combinations of alleles reflecting inheritance of one allele from each parent. What is very important is that A1 is not the allele, it is the marker for the risk allele. This means that A1 is not directly the allele but a region of DNA close to the allele provoking the disease, sufficiently close to be co-inherited most of the time with the disease allele. For III6 you actually know that a recombination must have happened as this subject obviously carry the risk allele (shows the disease) yet not the marker associated with it, therefore a recombination event happened between the marker and the disease allele. Not the answer you're looking for? Browse other questions tagged genetics human-genetics recombination or ask your own question.